Russian embassies and consulates in three Ukrainian cities were pelted with stones, eggs, green dye, and iodine as several hundred people staged protests demanding that Ukrainian pilot Nadezhda Savchenko be freed. One had to be dispersed with tear gas. 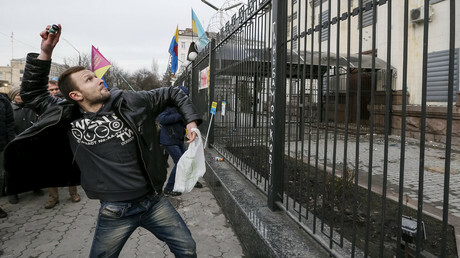 About 200 people gathered near the embassy building in Kiev and pelted it with stones, eggs, and iodine flasks for some time, embassy spokesman Oleg Grishin told TASS, adding that the situation was back to normal, as some of the protesters had left and the rally was nearing its end. According to RIA Novosti, around 300 people took part in the protest in the Ukrainian capital. The protesters demanded the release of the Ukrainian pilot Nadezhda Savchenko, who is currently on trial in Russia for complicity in the killing of two Russian journalists and crossing the Russian border illegally. The demonstrators were waving Ukrainian flags and held up banners and placards reading “Free Nadya,” “Russia, free Savchenko,” and “Death to Russia.” They also stuck placards on the embassy fence saying “#Free_Savchenko.” Riot police deployed to the scene reportedly did not interfere when protesters started throwing stones and eggs. The rally was attended by Batkivshchina (Fatherland) MP and party leader Yulia Timoshenko, who is also a former Ukrainian Prime Minister. A similar rally was staged in front of the Russian consulate in Odessa. National Guard and police at the scene had to resort to tear gas to fend off the crowd, which was throwing stones, eggs, and paint to provoke clashes. There were no injuries or arrests, however, TASS reports. Meanwhile, a Russian flag was ripped from Russia’s consulate building in the western Ukrainian city of Lvov during another rally in support of Savchenko on Wednesday, which was attended by more than 250 people. The flag was torn down by Ukrainian MP Vladimir Parasyuk, who entered the territory of the consulate under the pretense of submitting a petition to Russian diplomats demanding that Savchenko be freed. The MP then trampled on the flag, TASS reports, citing Oleg Astakhov, Russia’s consul in Lvov. Later, Parasyuk gave the flag to the protesters, who then proceeded to burn it. Some 15 people also tried to break into the territory of the embassy, but were stopped by security. Russian Senator Frants Klintsevich called the actions of Parasyuk a “wild and cynical as well as… utterly cowardly” act, adding that the Ukrainian MP had “demeaned himself and the entire Ukrainian parliament.” At the same time, Russian MP Vasily Likhachov demanded that Parasyuk be held administratively or criminally responsible for his actions and called for Ukrainian authorities to issue an apology to Russia for the incident. Ukrainian police confirmed that the incident with the Russian flag in Lvov had taken place, saying that it is now “looking into” the case. 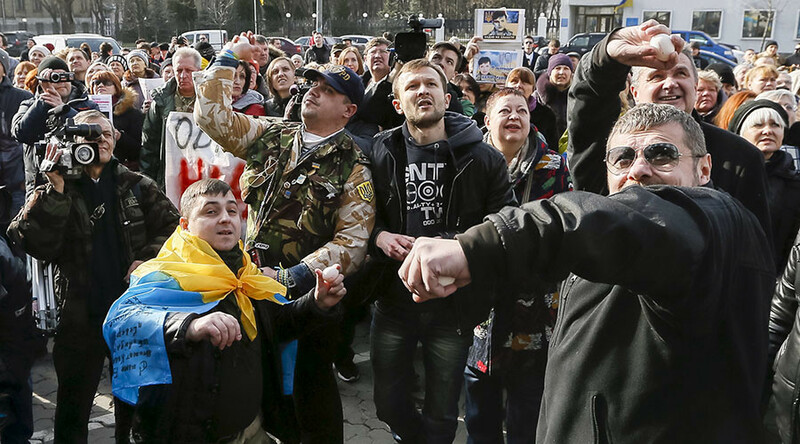 Violent protests have been ongoing in front of the Russian embassy in Kiev for three days. On March 6, around 100 people gathered in front of the building, with some tossing eggs and stones. Several windows and CCTV cameras were broken as a result. 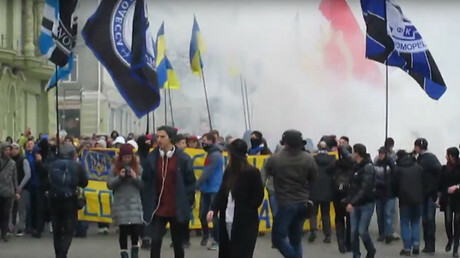 Demonstrations in support of the detained Ukrainian pilot took place in several other Ukrainian cities on the same date. The Russian embassy filed a protest with Ukraine’s Foreign Ministry following the attack, but has received no answer from the Ukrainian authorities. At the same time, Ukrainian Foreign Minister Pavel Klimkin said that he “fully supports peaceful actions” in support of the detained pilot, referring to the violent protests at the Russian embassy. His words were later echoed by the country’s prime minister, Arseny Yatsenyuk. In the meantime, earlier on Wednesday, Russian Foreign Ministry spokesperson Maria Zakharova accused the US State Department of attempting to influence the decision of the Russian court that is considering Savchenko’s case, referring to a statement made by US Secretary of State John Kerry, in which he called on Russia to free the pilot under the Minsk agreements. Nadezhda Savchenko was detained last July and charged with complicity in the deaths of two Russian journalists, Igor Kornelyuk and Anton Voloshin, near Lugansk in eastern Ukraine, as well as illegally crossing the border into Russia. According to the prosecution, she had reported the location of the Russian journalists to Ukrainian troops, which then shelled the area, killing the two reporters and other civilians. On March 3, the prosecution demanded a 23-year prison term for Savchenko, as well as a 100,000 ruble ($1,370) fine. The court announced on Wednesday that it would deliver its judgment on her case on March 21-22. The situation has provoked much controversy and drawn international attention, as Ukrainian activists claim that Savchenko is a political prisoner and extol her as a hero. Since being in custody, the pilot has attempted two inconclusive hunger strikes to protest the length of her trial process. She has been on a dry hunger strike, refusing to take both food and water, since March 3.